8blocks4x7layout, a photo by capitolaquilter on Flickr. You're probably wondering what the heck is up with 3 posts in one day for goodness sakes. I've been saving my blog pics to the desktop and inserting them in the post which is kind of a pain since I really like to import from my camera direct to flickr and edit in picnik (while I still can). So this is a test... and only a test... to see what the heck the "share" button does. You all are probably snickering at what I novice I am right about now. I'm learning and this is a good trick. Yeah, it seems to have worked. One final test run before I post the Tassels tutorial to be sure the directions actually work. I'm sure you can appreciate that! Having only made two Log Cabin quilts in my life - both of which I consider favorites - I was excited when Mandy chose the pattern for her swap row. Here's a picture of the squares on the design wall and auditioning for placement on the top. Using the diagonal lines on my cutting board and the lines on my ruler, I turned them on point and cut the tips off two sides. Then I cut 7" squares of cream in half to create the setting triangle. Once squared up, I sashed with a 2" strip, added a 5" piece of Tula Pink background Mandy had provided to each end and attached the row. The rich pallet and log cabin theme with alternating large/small & 4/5 per row is giving this top such a cohesive design. Even though I really like the way the blocks look on their own, if I had sewn them in as squares they wouldn't have supported the overall look of the top and would've given it a bottom heavy appearance. They measured 12x12 but seemed so much larger and rigid. I'm happy with the final result (see earlier post) and glad that Mandy is too. I've been sitting on this swap for much too long - the hearts were added by Jan on Valentine's Day and then she mailed the top to me. So this week I got my act together and created what I call Tiger's Eye Log Cabin for Mandy's Row Robin quilt. The other blocks were each made of a single fabric, and I decided to mix batik and floral instead. The number of combinations that I auditioned was ridiculous, my stash buckets got a work out. I was going for continuity but wanted the subtle jagged center to be visible. Around the Bend and Across the Pond! is my first swap of this nature and I'm really enjoying the process and variety. 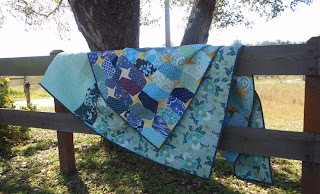 There are six seriously talented quilters in our group making it fun to push my creative limits to try and keep up. I'm also finding that naming blocks and quilts is really fun. 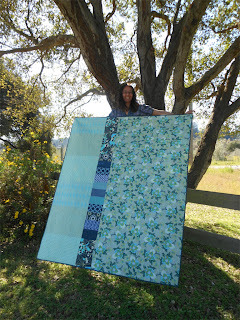 Jenny even credited me with naming Urban Deco, an awesome block with a tutorial at Sew Kind of Wonderful. This one reminded me of a Tiger's Eye ring I had in High School and I love the meaning of the stone: Patience, Focus & Determination. Three traits that come in handy with quilting I'm sure you'll agree. Check out Blades of Grass for Moni and the row I made for Jan using my Phillip Jacobs second-hand scraps. Susan posted that she's added the third row to mine and will be uploading pictures soon - can't wait! They are nearing the half-way point and really taking shape. Next up is our fearless leader Dana's row with whimsy and solids - time to break out some Heather Ross! April is my month to choose a block for Friends + Fabric = AMSB (a modern swap bee) and I thought I had it nailed. I'd narrowed it down, made my test blocks, even posted a discussion thread - but classic Karen - I'm changing it up last minute. 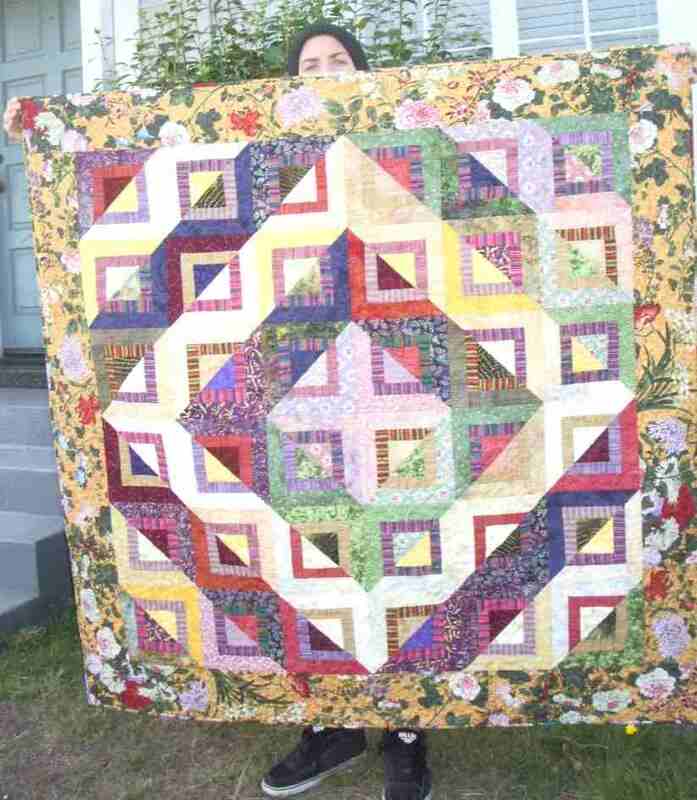 The pattern is inspired by my Crush Quilt which was made using Cheryl Malkowski Dancing Twilight Pattern. It's really only the layout that is different from my first prototype but I also decided that winging the placement of the triangles might be tricky for some and that trimming off the excess each time was less time efficient than simply stacking and cutting ahead of time. I promised a template option - don't know why - I hate templates, they make me cringe. Hope to have a step by step posting in the next few days. Seems tempting to do an April Fools joke and ask for a wildly difficult block, but anyone who knows me can testify how I just don't get the appeal of practical jokes. Besides, these ladies are way too fabulous and bright to pull a fast one on. Check out some blocks I've made so far: Crazy Crayon Box for Jen, Half Rectangle Triangle for Maria and Diamond Log Cabin for Linda. I'd make them all again. They were great choices. I named it Starburst Double Take since it took a second go at it to get it right and also for the double burst instead of the original single one. Looking at it now I think it could be called "Tassels" hheee hheee.... if I was naughty. I'm so excited the day if finally here. Link Ups are a blast - I can get caught in a total time warp clicking on them - but it's so great to see what everyone is up to. The Festival of Scrappiness at Stitched in Color (one of my favs) has been a great way for me to share my projects. It's made a wonderful way to start the year finishing and certainly is making my Monday. Check it out! The name of my blog should be Second-Hand Scraps and I added that as the sub-title. Even though I love, love shopping for fabric there is something more appealing about rummaging through left overs. Creating from out cast is much more rewarding to me and I find myself the eager recipient of baggies from friends as often as I can. 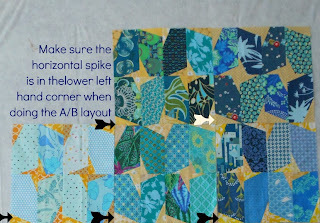 The quilt I'm most proud of is Blogger's Block a Palooza made entirely of scrap except for the binding. I was on the fence about joining the QAL. Not because it isn't going to be great, but because I'm spread so thin and neglecting my many other QALs with a bit of guilt building up. But I'm a joiner after all and the line up of blog contributors was just too much to resist. My book may arrive after the official start but since I'm running chronically behind lately, no biggy. My bitty stash of Washi just sits waiting for a project. I don't have enough for an entire quilt but certainly enough for some of the small items on the QAL list. 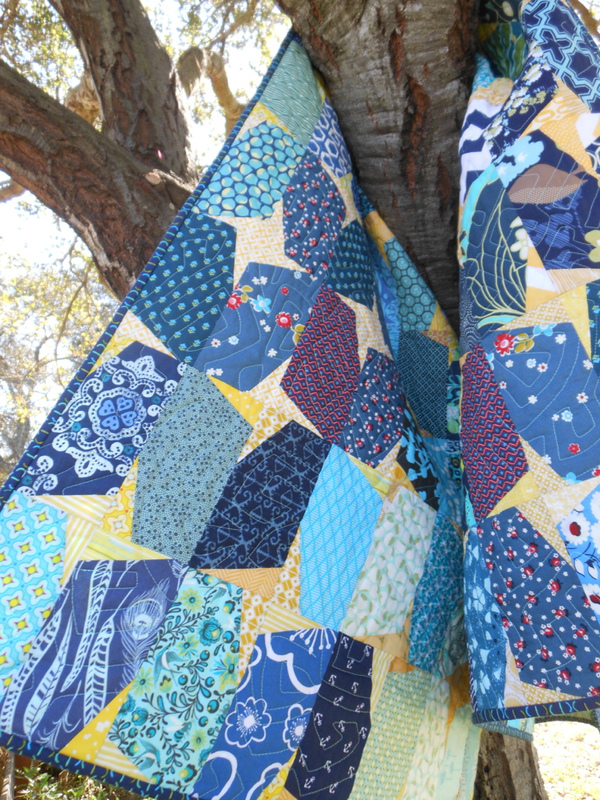 I fell in love with the Baby Washi Quilt and immediately put it in my favorites. In my browsing, I found this adorable snap coin purse tutorial, so simple and cute. If my goal is to attend Sewing Summit 2012 and the classes offered will be outside my quilting experience box, then I'd better get my feet wet making non-quilty items before hand so that I'm not totally in over my head. Tickets go on sale next week making it closer to becoming reality for me. How about you - Who's going that I might (virtually) "know" ? New York Beauty is sort of kicking my behind. It's hard to keep up the momentum and make progress when it's at a snails pace. There's no denying those points are pretty but there are so many other projects that are calling my name I continue to struggle with this QAL. I skipped last week, am doing 2 instead of 4 yet it's still too much. I do enjoy visiting the blogs - some on the list I already follow and others will be new. This time I left the paper on like Megan showed at Canoe Ridge Creations so that was a bit different. I loved how many pictures and steps she included in her tutorial. Link ups are so inspiring and hers make Mondays a bit brighter. You should check it out if you haven't already. 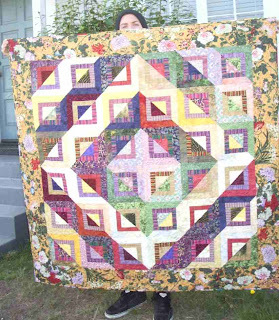 I was reading my flickr friend Jen's blog the other day, excited for her that she had her beautiful queen size DS Interlocking Wonky Stars in a Quilt Show because I could totally relate. Hearing about the collaboration between LAMQG and the Glendale Quilt Guild is awesome. I fondly refer to their guild as "the mother ship" - not sure who said it, but it's oh, so true. It may be old news, but because it was BIG news - today's blog is about my 5 quilts shown at last months Pajaro Valley Quilt Association 34th annual Quilt show. How very generous of PVQA, such an the established guild to embrace our local newly formed chapter of the MQG and extend an invitation for a Special Exhibit within their show. I'm hoping that they will continue to do so in the future. It was a challenge to keep my labels 75 words or less but it was important to me that I give proper credit to the bloggers, QAL, tutorials, flickr groups and swappers who were a critical part of making my quilts. I'm also hoping that after reading how much fun I had participating, that they went home and looked everyone up. Maybe they'll catch the joining bug like me. My three quilts were in good company with the amazing work representing South Bay Area Modern Quilt Guild - looking down the row was so eye catching, we definitely turned a lot of heads! So many of my friends and family came out to see the show for the first time making it a really extra special personal experience too. In addition, I entered my Blogger's Block a Palooza and the Blue and White Plus One challenge mini since I'm also a member of PVQA. The scope of the show has always impressed me but after seeing it from the other side rather than just attending, it is even more staggering. Volunteering was a blast, to be part of such a well run event made my job easy. Next year I'm signing up for more duties and am already thinking ahead what quilts to make and share. Good thing it was so fabulous because it's keeping me from going to Quiltcon being held on the exact same dates (still not quite over it - but trying & planning on sending in the block challenge for kicks). Block 0 of the NYB QAL, how hard could it be with a name like that? Well, I visited a new blog - a good part of the reason for doing QALs if you ask me.... Kim at My Go-Go Life did a great job in her tutorial and I loved the fabrics she used. There were several tricks I learned so that part was lovely. None the less, I'm just not sure it's my thing. I thought I'd chosen well with a warm/cool contrast but as the sun went down - which it did, because it took all day - the values seemed sort of blah. Then came the challenge of sewing the outer and inner background. The gentle slope of the brilliant Quick Curve Ruler and easy slant when I improv are enjoyable, but this was something else all together. Still a couple weeks behind and for now, I'm going to aim for two of each block and see how I hold up. For The Love of Solids Swap is so much fun to browse right now because everyone is receiving their packages and posting pictures. With 100 participants there's a whole lot of eye candy. Check it out. The South Bay Area Modern Quilt Guild challenge was to create a quilt inspired by a photograph. I chose this one taken at Hanalei Pier a few years back during one of my treasured vacations in Kauai. The sunset was so serene and subtle this particular evening. I used batik scraps and ended up with a bit more literal an interpretation than intended. It was fun to test out the gentle curve piecing technique in the water and sand area based on the demo by Pam Rocco at our March meeting. Here is a close up of the organic straight stitching along the pier and some twists and turns throughout the sky and water. My original plan was to try a water style quilting technique that I've seen but that will have to wait for another project. Seeing what others come up with will be exciting.